I love this time of the year, the news just keeps coming about new products and something that will always turn heads is a new Marshall Amp, especially when it is a signature Yngwie J Malmsteen amp! 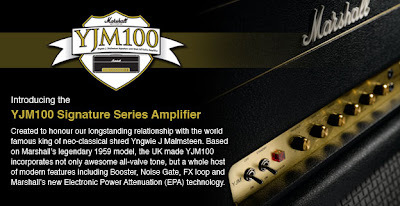 Marshall Amplification is proud to present the Signature YJM100: a 100-watt, valve head that was developed in close conjunction with the legendary Swedish six-string shredder, Yngwie Malmsteen. The YJM offers the perfect balance of vintage tone and looks alongside modern features which makes the amplifier the perfect players' tool for 'œplug in and play' recording or live performance. 1. 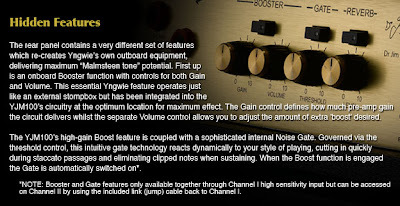 Footswitchable* Boost with controls for Volume and Gain on the rear panel. 2. Footswitchable* Noise Gate with rear panel Threshold control. 3. 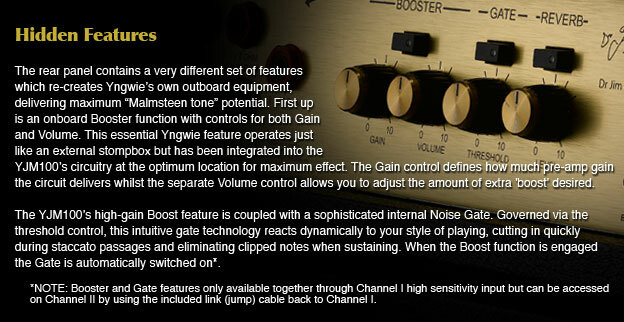 Footswitchable* studio quality Digital Reverb with rear panel Level control. 5. Half power switch which takes the output power from 100W to 50W when engaged. 6. Built-in, infinitely variable Attenuator control which can take the output stage from 100% to 0.01% and anywhere in-between, while retaining the all-important tone and feel of the all-valve power section. This means the output power can be reduced to a staggering low of 0.05 Watts when in 50W power mode. 7. Valve Failure Circuitry: meaning that if one of the output valves develops a fault, a visual indicator on the rear of the amplifier shows which one is working incorrectly. This 'œroadie friendly feature' will save valuable time getting the amplifier back up and running again, should a valve failure occur. 8. Self-biasing circuitry to ensure proper power valve operation each time valves are changed. *NOTE: A four-way Footcontroller (PEDL-00046) comes supplied with the YJM100, facilitating switching of Booster, Gate, Reverb and FX Loop features. This Footcontroller has been designed using Marshall Amplification’s patented STOMPWARE® Technology, allowing the user to connect it to the amp using a standard 1/4″ guitar cable.